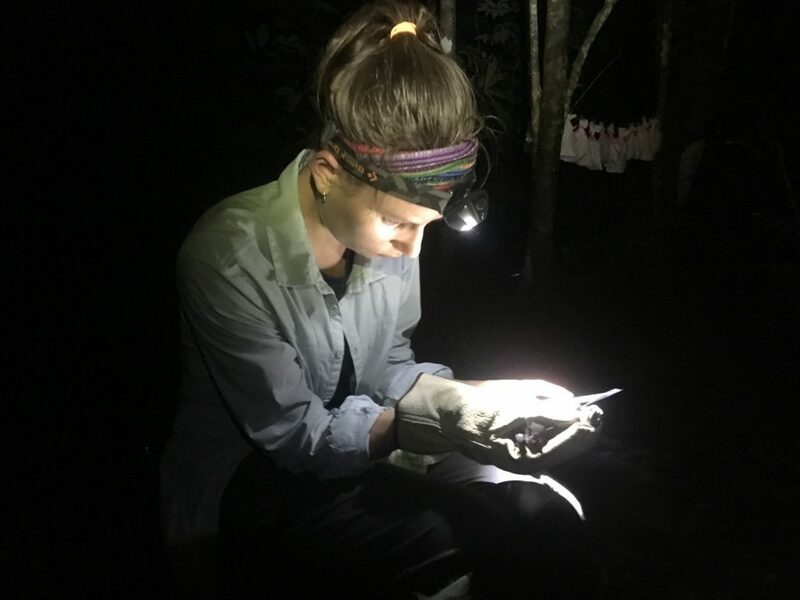 This October, I ventured out of the sanctity of the jungle to present at the 48thNorth American Symposium on Bat Research (NASBR) in Puerto Vallarta, Mexico. Over 300 researchers from across the globe gathered to share bat stories, communicate their research, and further our understanding of this hugely diverse mammalian group. Because of its location, the conference offered many opportunities to discuss the conservation of bats in the tropics, presenting a great opportunity to share Osa Conservation’s work on surveying bats in the restoration plots. It was very exciting to see our Restoration and Rewilding efforts so well received by a bat-savvy audience. Researchers were curious to hear about the ways in which Osa Conservation is “restoring forests for bats”. 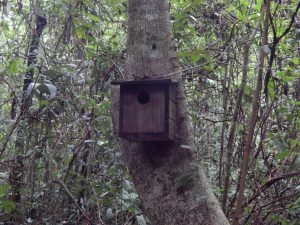 This project is focussed on attracting bats to areas that are actively being restored, for example by planting flowering trees like the balsa, and installing two-meter-tall bat boxes, all with the aim of restoring bat diversity whilst the forest is regenerating. 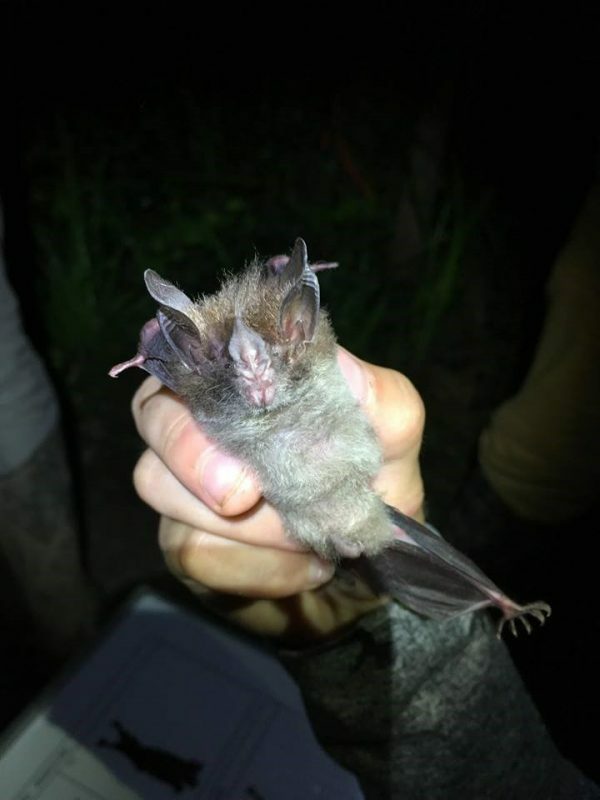 Excitingly, the bats of the Osa Peninsula were able to reach the audience in Puerto Vallarta beyond the scope of the restoration project, by researchers conducting work at and around the Osa Verde BioStation. Beatriz Lopez, from the University of Florida, discussed gathering bat echolocation calls on the Osa Peninsula to document species diversity, and Dr. Doris Audet from the University of Alberta, shared her research on bat exploratory behavior in the field. 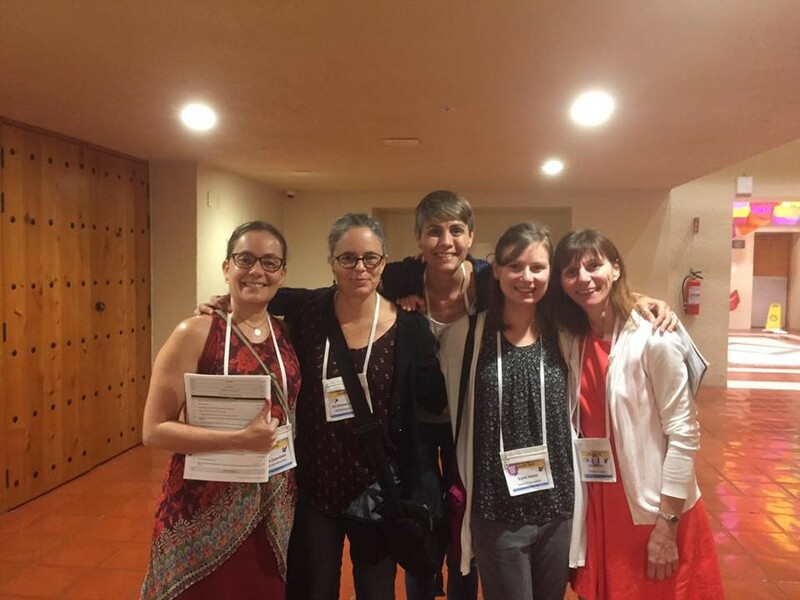 The conference was also a wonderful opportunity to discuss advances in bat research in Costa Rica with Dr. Gloriana Chaverri from the University of Costa Rica, who has planted deep roots of bat research on the peninsula over the course of her career. The presence of bat research on the Osa Peninsula, and Osa Conservation’s important contributions to supporting that research, was very well represented at NASBR 2018. The Osa Verde Biostation is truly a gem for bat diversity, with over 50 recorded species of bats to date, and sharing Osa Conservation’s involvement in conserving and restoring habitats for bats ensures that those contributions are recognized and appreciated by the bat community at large. Blog por Lucía Vargas Araya, Coordinadora de Experiencia de Conservación. “Hay dos pumas en el sendero”- me dijo mi compañero Leiner por un mensaje que recibí estando sentada en mi oficina en la Estación Biológica Osa Verde el otro día. Emocionada, le avisé a los compañeros que estaban cerca mío, nos pusimos zapatos y salimos rápidamente hacia El Sendero Las Tortugas, donde esperábamos encontrar a los felinos. La entrada del sendero está justo al costado de La Estación y continúa hasta llegar a Playa Piro. Como Leiner no especificó en qué parte del sendero estaban los animales, desde que entramos al mismo y nos encontramos rodeados del bosque, el corazón latía fuerte; podían estar ahí camuflados detrás de cualquier árbol. Continuamos a un punto del sendero donde se debe de cruzar el Río Piro y entonces, el suspenso aumentó. Caminaba poniendo mucha atención a mi alrededor, cerca y hacia la distancia, tratando de detectar a los pumas, pero también viendo el barro que pisaba para no resbalarme. Quienes estábamos en búsqueda de los pumas, íbamos con los ojos alertas y nos hablábamos en un tono muy bajo, casi como un susurro, para no espantar la ilusión de verlos de cerca. Continuamos el sendero, paralelo al río, hasta llegar a un cruce. ¿Cuál camino debíamos escoger? Ahí nos quedamos unos segundos hasta que decidimos tomar el de la izquierda, el que se aproxima al vivero de huevos de tortuga en Playa Piro. Nuestro caminar se volvió más pausado y esperamos a que Leiner respondiera el celular para saber si aún teníamos esperanza, pero no respondió. Finalmente, nos topamos con quienes habían tenido la oportunidad de verlos y nos dijeron que ya los habían perdido de vista, se habían ido. Sin embargo, se sabía que estaban cerca porque escuchábamos aún el aullido típico de un mono que está observando a su potencial depredador. Esa tarde no encontré al puma, pero sentí una profunda gratitud de que el bosque de Osa se hubiera convertido en mi nuevo hogar. En este rincón palpitante de vida las posibilidades son infinitas. Aquí cada día estamos a la merced de la naturaleza; cada día puedo ver algo que nunca había visto antes. Y, además, aquí todos los días aprendo. 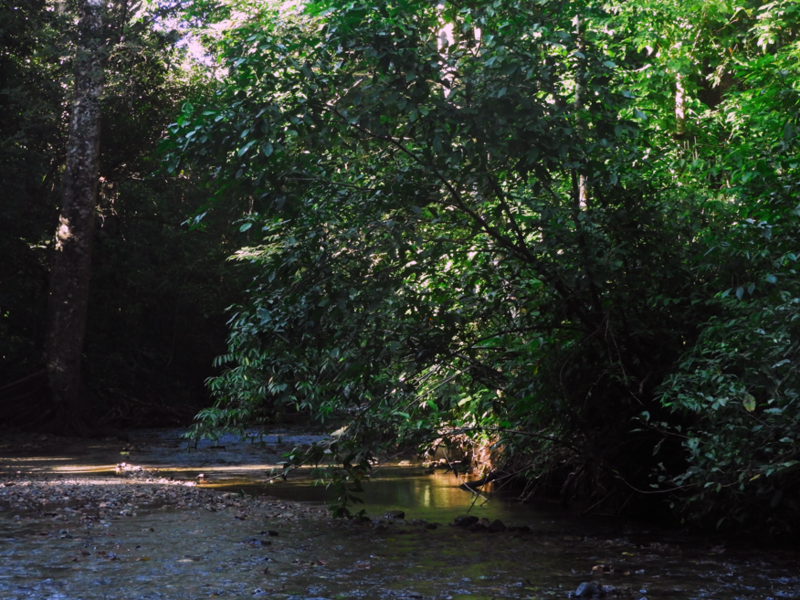 Esa tarde tuve una excusa para distraerme en el bosque y visitar el río Piro un rato. Además, iba en compañía de espíritus aventureros, que luchan por proteger lo que aman: la naturaleza; de la cual son parte. My work is never the same from one day to the next on the Restoration and Rewilding Program, which encompasses many diverse projects that require frequent monitoring. There is plenty to do, I always arrive at lunch hungry and satisfied after mornings of hard work. 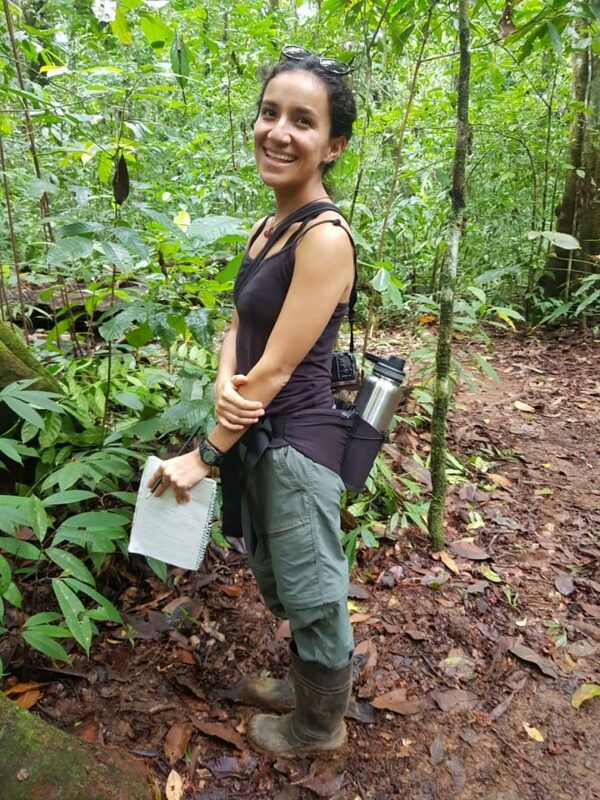 I want to give you an insight into my first month of being a Restoration and Rewilding Research Field Assistant. We are employing a variety of approaches and techniques across the rewilding plots in order to “rewild” an array of animals to return to recently reforested abandoned grassland. Our idea is that as the overall species diversity increases, inter- and intra-species interactions within the regenerating areas will begin to re-establish. With some patience and continuous monitoring, we the aim to demonstrate a restored harmonic ecosystem functioning of the Osa Peninsula, and its associated key ecosystem services. 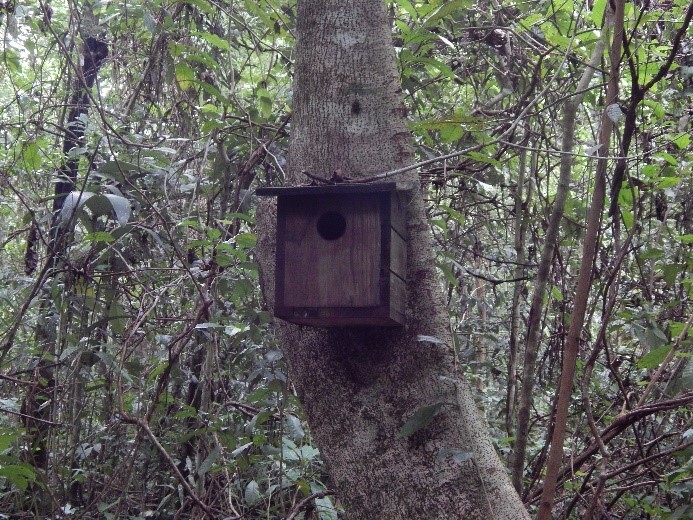 One project in the restoration plots is the installation of nesting and roosting boxes to attract birds and bats. To accommodate a variety of species, there are 5 bird box designs, each differing in dimension of the entry hole and the box itself. The frugivorous species belonging to both birds and bats play a vital role in increasing the rate of seed rain, and consequently, the rate of seed dispersal and reforestation. One day of my week is dedicated to surveying the wonderfully diverse bats that are choosing to use the rewilding plots. The morning’s duty involves erecting mist nets in preparation for the evening’s bat survey. Come the evening time, the team heads back out into the field to open the nets. When the clock strikes six, the monitoring begins, and the excitement of the possibility of catching a new species record ripples through the team. The following morning, decaying log piles and epiphytes (such as bromeliads) are translocated to the rewilding plots to increase microhabitat availability, in an effort to rewild amphibians and reptiles. 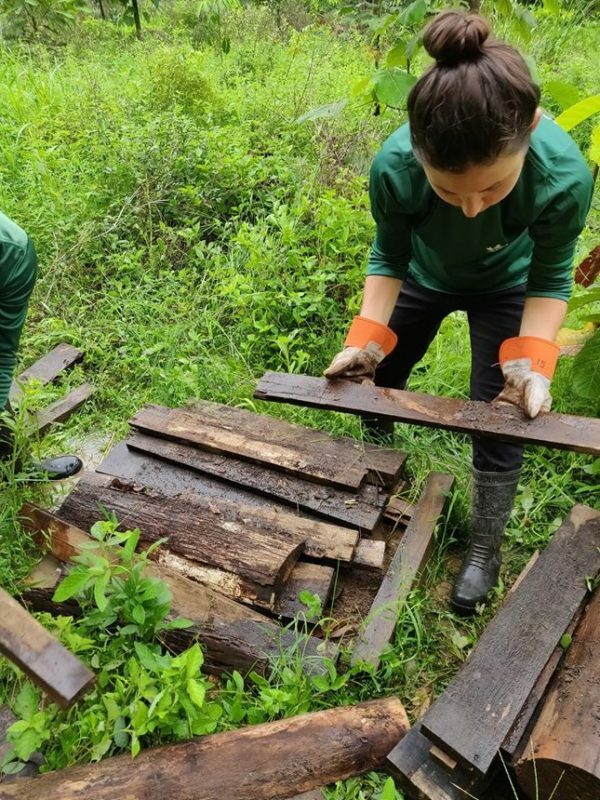 Such microhabitats occur naturally in the primary forests, usually providing refuge for different invertebrates, such as centipedes and millipedes, and for amphibians and reptiles, such as leaf-litter frogs and sun-basking lizards. 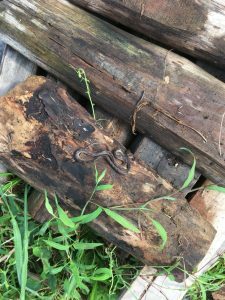 It is always a pleasure to find a fer-de-lance coiled peacefully within a log pile in a rewilding plot. While the log pile project is relatively new, we have already observed a rapid return and colonization of several amphibian and reptile species within a short period of time, which is highly encouraging. Undeniably, a huge effort, in terms of time and determination, is required to create a biodiverse and ecologically restored forest ecosystem. 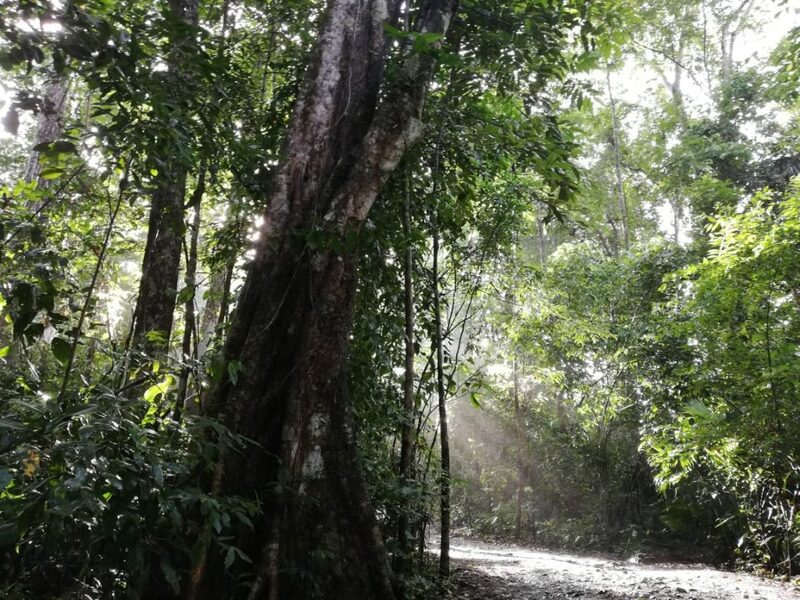 Fortunately, the team of highly-motivated and enthusiastic people that constitute the Restoration and Rewilding Program indicates a promising future for Osa’s forests.